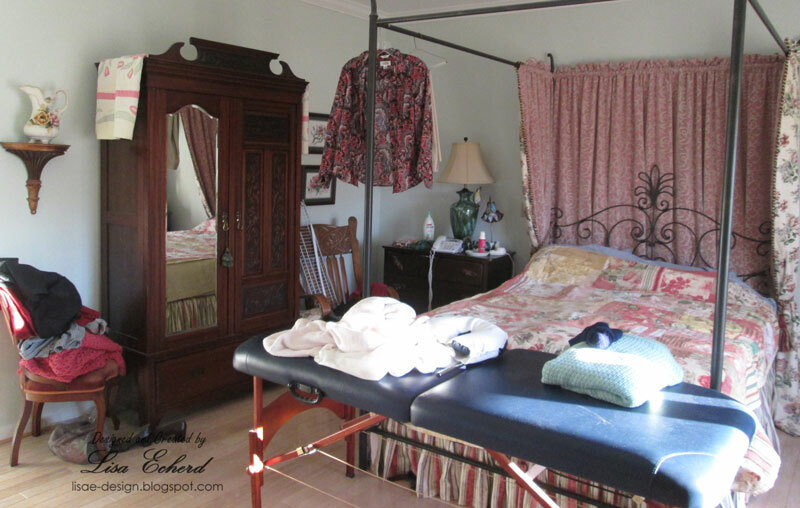 Have you ever noticed how passive-aggressive even the most agreeable husband can be about decorating? It was a very pretty room for a long time but then it became more and more dated. Toward the last years of my 16 year window treatment business which I closed in 2013, everything had gotten very simple. Simple, simple, simple was all I was hearing from clients. Fabrics were luxurious in texture but had little variation in colors. Finding more than two colors in one fabric was rare. It took me awhile to embrace this look for myself. Clearly I'm a 'more is better' girl when it comes to fabric. 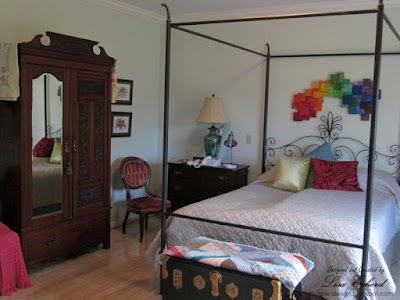 What I wanted for our bedroom this time around was a semi-neutral palette that I could use as a backdrop for art, quilts, pillows and accessories. I'm not looking to buy more accessories just to swap some things around in the house. I wanted a more modern look but almost all my accessories are antiques. So I've mixed styles here. 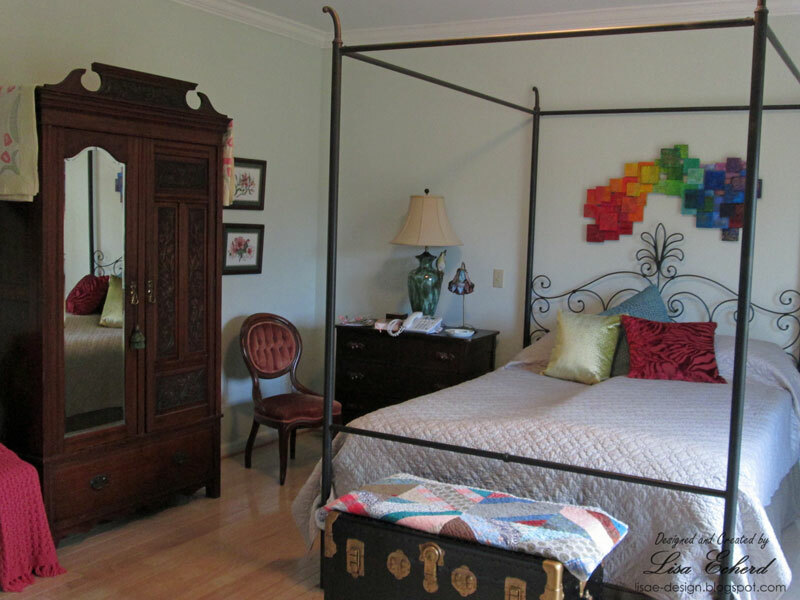 The draperies are more midcentury look, the bed is more current and the antique furniture and accessories start in the late 1800's. What works for me the most is that it is orderly and fairly easy to keep that way. I have this embarrassing photo taken just before I de-chintzed the room by removing all the old window treatments and bedding. Things had clearly gotten out of hand. 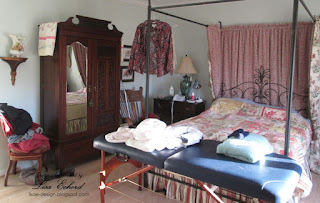 The qulited bedspread and pillow shams weren't even on the bed anymore at that point. 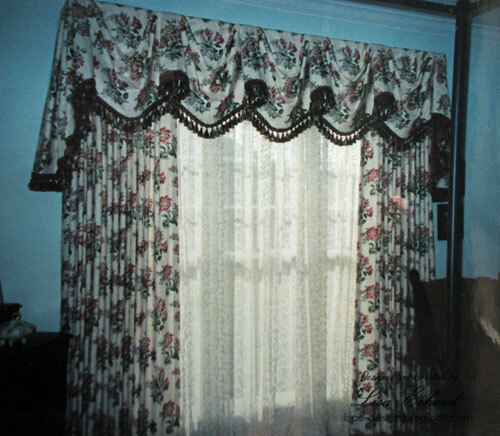 I made new window treatments early in the year using the ivory and gold fabrics my mother and I selected. These are blackout lined per my husband's request (see, if you tell me what you want, you want you might get it :-) I'm so glad I made them when I did as they were a wonderful help this winter as he recovered from some surgeries. With everything that was going on, I didn't work on the new bedding until the last month. The bedspread is from Steinmart and was exactly what I was looking for - a soft gray stateen quilted in a pattern I could turn in any direction. It is a king size even though we have a queen bed because the ready-made bedding industry has never learned how to measure a bed or realized that mattresses are now more than 6" deep! I can turn this sideways and have enough drop off each side to cover the mattress. It is even reversible with the same fabric on the inside. I found the bedskirt fabric at a discount fabric store and did a tailored style rather than ruffles this go round. It's just a neutral that is easy to work with. The pillows were actually the biggest investment of the bedding as the luxurious fabrics were not cheap. I kept them simple knife edge without even any cording. My clients would be shocked at the lack of cording, buttons or flanges. Simple, simple, simple. 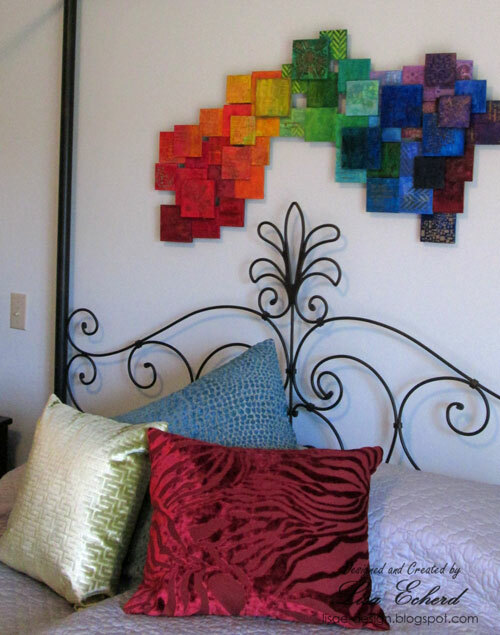 Really the pillows are to compliment the art piece. I've had this planned for months. The planning though was more in my mind in vague theory about how it would work. Reality was a little harder to achieve. 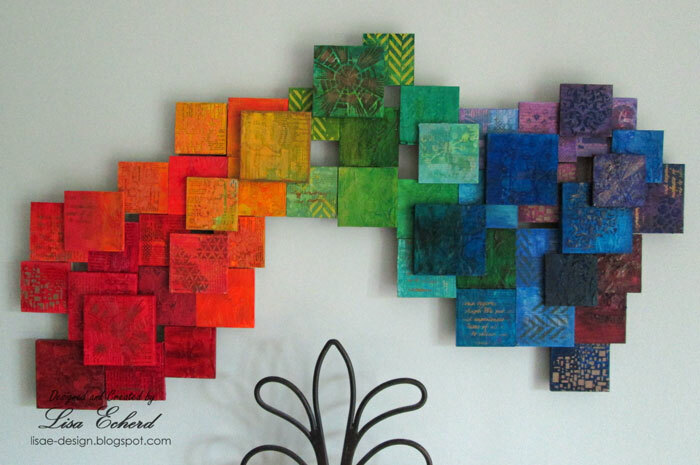 the blocks are from a thrift shop that takes in materials you can use in arts and crafts. These started as finish samples for the furniture industry. I bought dozens and dozens of them for a dime and quarter each. I coated them with gesso and then started adding color. The first weekend I really started to pull this idea together I thought it was a loss. So much of a loss that I dashed off to Michaels on Memorial Day to get some large canvases on sale and just come up with something else. In that process though I had an idea that might work with the little squares. I'd been going for some sort of circular pattern over a cluster of squares but I didn't have enough continuity of color. The squares just didn't work together. In this version I went with a rainbow color scheme and I swear I didn't start out to arch this like a rainbow but that is what happened when I started putting them together. They are hot glued to some strips of wood on the back. 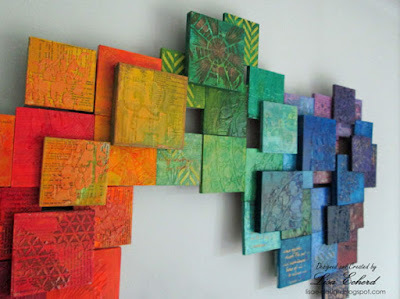 Each square has lots of layers of paint, stenciling, some book paper, and gel medium. I had to lay it all out on the dining room table to glue it together and other than burning my right index finger (ouch!) it went smoothly after a rocky start. The only thing left in the room to update is my dressing table still skirted in the striped chintz. I'm still thinking on that one and it can certainly wait a few months. The update was very inexpensive. 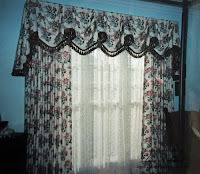 The drapery fabrics were the most costly and were a Christmas gift from my mother, bless her. 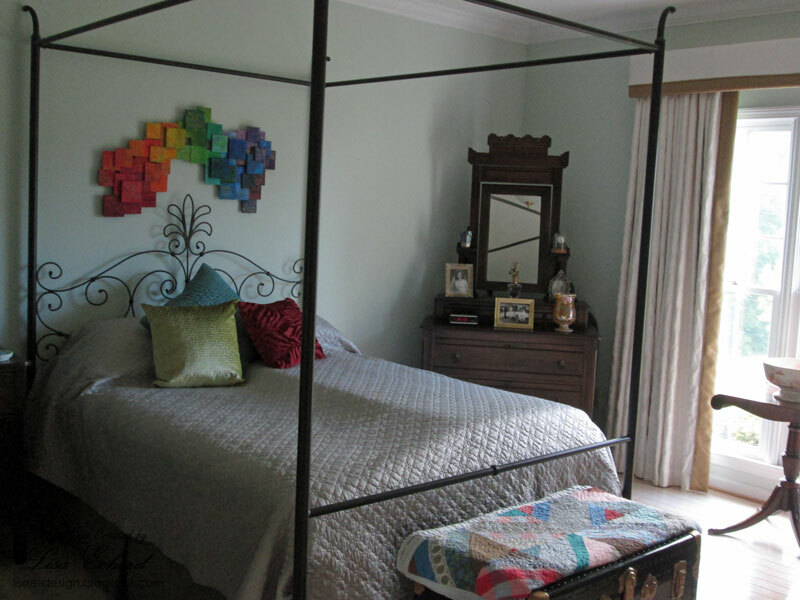 The bedding and art piece materials all cost under $200. 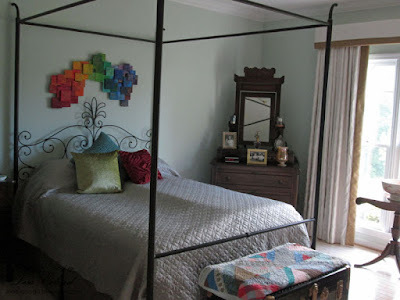 Lisa, your room looks beautiful! Your original artwork is stunning, particularly when the tiles were so inexpensive. Who could believe it if they didn't see it? Brilliant!